The synopsis for Guy in Real Life had me intrigued. The story sounded like it would be a fun read, and the cover was super cute, so I couldn’t want to check it out. The story starts off with a bang, and because of that I had really high hopes for the novel. I had read a lot of great reviews for the book, even some which compared it to the writing style of two of my most favorite authors. Unfortunately I couldn’t seem to get into the book as much as I really wanted to. The storyline for the book mostly revolves around gaming and role-playing. I’m not much of a gamer anymore, even though my husband is a huge gamer. Unfortunately I wasn’t really interesting in any of the gaming talk. I actually ended up skimming through most of it. However, I can see how people that are gamers would find it interesting. 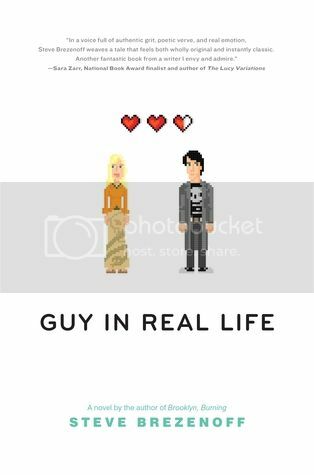 I did enjoy the ‘real life’ parts of the book, where the characters weren’t involved in the game. I found myself looking forward to those chapters the most. The chapters rotated between the two main characters points of view, which kept things pretty interesting. The two main characters in the story were Lesh and Svetlana. Svetlana was a really interesting character. She was referred to in the novel quite a few times as a hippie, and I think that is a pretty accurate description for her. I found her to be a very likeable character. Lesh, the metalhead, was a much more complicated character. It almost seems that he is ‘finding himself’ in the story. There is a bit of a plot twist for Lesh at the end of the story, and I was actually left kind of confused with this twist, but I think that Lesh was pretty confused about it all as well. Overall; while I didn’t enjoy this book as much as I wanted to, I can definitely see the potential and can see other people really enjoying the story. Unfortunately it just didn’t work for me.